Arabs from Kafr Qusra stone Jewish activists hiking near site of Thursday's attempted lynch of school children. Dozens of Arabs from the Palestinian Authority town of Kafr Qusra on Monday morning threw rocks and stones at Jews hiking in the area. 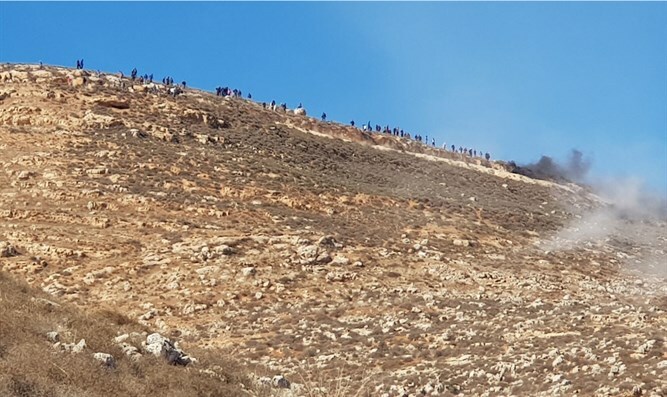 The Jews, right-wing activists from the Otzma Yehudit movement, were hiking in protest of Thursday's attempted lynch, which occurred when Qusra Arabs assaulted a group of 25 children, throwing stones and spraying pepper spray at them during a Bar Mitzvah hike. The children were escorted by two lawfully armed guards – both of them school staff members. The organizers had coordinated the hike with army officials and received a green-light to take the group. Yet, when the Arab lynch began, it took an hour and a half before IDF forces arrived to rescue the children. "In response to the lynch on children last week which occurred near Kafr Qusra, and the IDF spokesman's announcement that every hike in Judea and Samaria requires approval, we will hike on Monday to the cave where the children hid on Thursday," Otzma Yehudit announced. "We will inform the IDF, but we will not ask for their approval. We will emphasize the IDF's failure to react to the incident. We will show a Jewish presence in the area, emphasizing to everyone that this area will become a favorite among hikers." IDF and Border Police officers arriving in the area fired shots into the air and distanced the Arab rioters from the area.